Swimming superstar Michael Phelps won his sixth gold medal of the Beijing Games, breaking his own world record in the 200m individual medley. The American won in a time of 1min 54.23secs, shaving 0.57secs off his previous best set in July and setting his sixth world record of the Games. 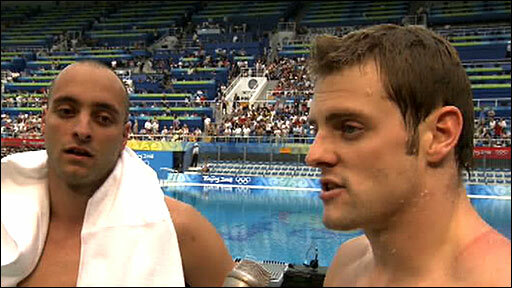 Hungary's Laszlo Cseh took silver and Ryan Lochte of the US won bronze. Britain's finalists missed out on the medal spots with James Goddard ending up sixth and Liam Tancock eighth. After winning races adding up to more than 3km, surely he can do it over one last 100m? 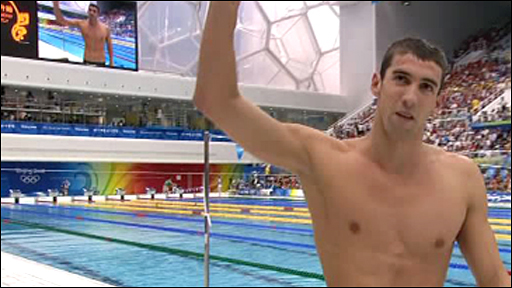 Phelps, who is chasing an unprecedented eight gold medals in Beijing, now has 12 career Olympic golds to his name. He led from the start of the race and finished strongly on his favoured freestyle leg, 2.29secs ahead of Cseh in second. Lochte held on for third despite having raced just half an hour earlier, when he broke the world record to take the men's 200m backstroke title. Phelps, 23, the dominant story of the Beijing Olympics, has now won the 400m medley, 200m freestyle, 200m butterfly, 4x100m free relay, 4x200m free relay and now the 200m medley, all in world record time. But he showed little reaction apart from a quick shake of his fist after his latest victory. 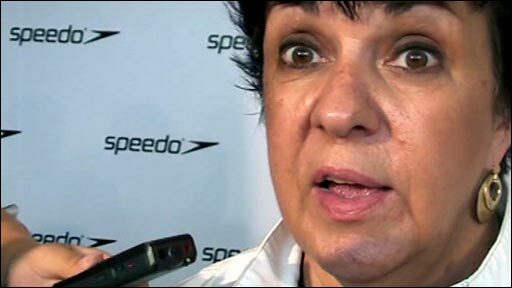 He is now closing in on Mark Spitz's 1972 record of seven golds at a single Games. Moments after receiving his medal for winning the 200m medley Phelps returned to the pool for the semi-final of the 100m fly, winning in a time of 50.97secs. "I switched from my dress sweats to my parka, shoes, threw my cap and goggles on and then they pushed us on out. No time," he said. "The medal was in my warm-up jacket." He added: "There wasn't much time but I think there's going to be a lot of time for me to rest over the next 18 hours or so, and I'll be able to be ready for tomorrow morning's 100." His main rivals in that final will be Milorad Cavic of Serbia and US team-mate and world record holder, Ian Crocker. "It's definitely a tough race," said Phelps. "With (Cavic) and Ian having a great semi-final, it's going to be a good race tomorrow. "I'm going to do everything I can to be a little bit closer in the first 50 and hopefully if I'm there at the 50, I'll be there at the finish." Assuming the US qualify, Phelps will then race in the 4x100m medley relay final on Sunday.